When you have gotten sick, you may have taken a gel cap of medication to make you feel better. A gel cap is actually a larger version of what a microcapsule is. A microcapsule is a microscopic gel cap that contains something inside. When you remove the outer capsule, you release the inside contents! The following activities will help you discover what a microcapsule looks like and some common applications for microcapsules. We hope you enjoy these activities and do them together as a family. How do you use your scented inserts to develop a real scientific experiment? Scientists make observations to develop their ideas. In this activity, you will examine which scents last the longest what which adhesives work the best. Who is the best at picking out what your scratch and sniff sticker smells like? Challenge your parents and your friends! You will make some scratch and sniff stickers in this activity and use them to determine if people can guess what your stickers smell like. 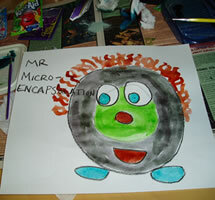 Can you make a simple model of a microcapsule at home? Of course you can! In this activity, you can make a model of some special microcapsules developed by NASA using common household items. Watch out with your microcapsule pops! What makes scratch and sniff stickers smelly? Microcapsules are actually used to make these smelly stickers! In this activity, you can make your very own sniff stickers. Try and think of some creative smells you can use!